The prestigious Bank of Montreal in Edinburgh is an impressive building based on George Street. Steeped in history, the Bank of Montreal wanted to create an inviting reception area for customers and employees to visit and work. Working with Manchester architect, TP Bennett London, Kinorigo were delighted to provide the stunning finish that can be seen throughout this commercial property. 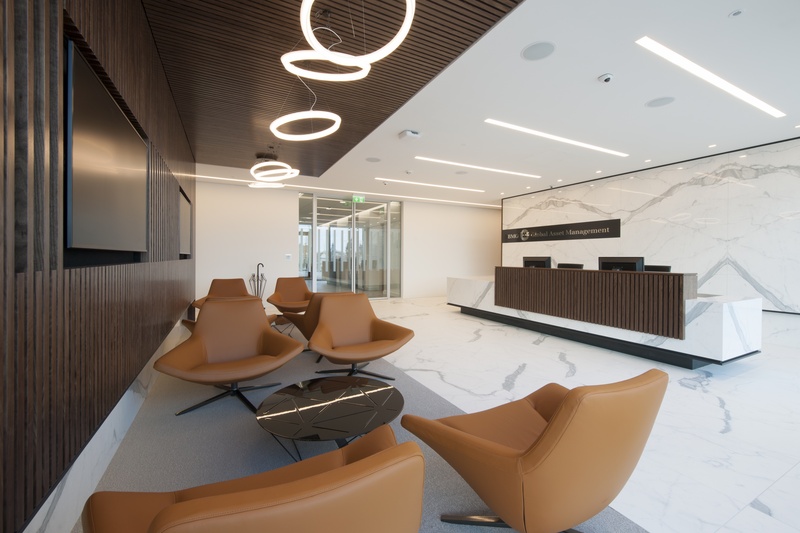 In July 2017 we began by cladding bespoke furniture in stunning porcelain for the main reception desk and then perfectly matching the furniture with complementary floor and wall tiling to create a seamless look. For this project, we used Absolute Bianco, which is a replica of white marble with a natural veining that is so realistic, it's hard to differentiate from the real thing. Benefits of using this product are that it's lighter weight, lower maintenance and easy to keep clean. We used a special non-slip finish on the flooring which helps to make it safer to walk on without compromising on the quality or appearance. The entire project from concept to completion took four months and we finished on time and on budget. We look forward to collaborating on future projects with TP Bennett & Sharkey and the Bank of Montreal in the near future. For more details on products used: Absolute Bianco polished, sizes: 3000 x 1500 & 1500 x 750.